No matter what industry your business is in, when it comes to achieving top results, this can never happen unless your team is engaged, motivated, and committed. However, while many organizations have a focus on enhancing corporate culture and appreciating employees these days, with so many more remote workers than ever before, it can be easy for people who are not in the office to get left out. Read on for some tips you can follow today to ensure all your staff members who work remotely get recognized and rewarded regularly. For starters, never forget that saying thank you to people for a job well done and for putting in a big effort can go a long way. It doesn’t matter if your workers are on the other side of the globe or working from home in the same city as you; you can send them a heartfelt letter or email, pick up the phone, or use Skype, or some other online system to tell them how much you appreciate what they have done or are doing. Make sure that your thank you is specific, personal, and genuine. Mention exactly how the person’s contributions had made a difference to the business and/or to your own work life as well. By directly correlating someone’s efforts to the impact they have had, this shows just how much they are valued and a worthy part of the team. When it comes to handing out thank yous, don’t forget to pass on gratitude that is expressed by the organization’s clients, suppliers, co-workers, or anyone else that your employees might have dealt with too. This is important information for workers to know and can give them a real boost, as well as the impetus to continue making efforts. Employees also feel appreciated and cared about when they receive awards, gifts, and perks from their bosses, regardless of whether they’re on-site or remote. As such, look for ways to reward efforts and results. For example, you can publicly acknowledge workers by giving a shout out to them on social media, in a company newsletter, at an event they’re attending, or via an online group chat. 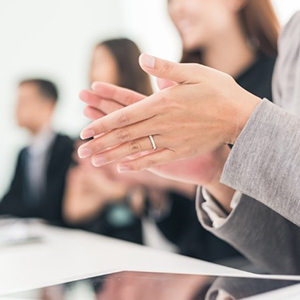 Establishing an “Employee of the Month” or other type of program where you hand out certificates, plaques, or crystal awards can also be a great way to make your team feel noticed. Just because some employees may work remotely, this doesn’t stop you from handing out awards — you can have them mailed to them, hand them out in-person at the next company event they’re attending, or arrange for the awards to be presented at their own office. Gifts and perks always go down well with employees of any age and position, too, and don’t have to cost you a lot. For example, you can reward people with movie vouchers, hampers, bottles of wine, a massage or spa voucher, a gift card for their favorite store, flowers, chocolates, and much more. With so many online stores shipping around the world these days, it’s not difficult to have a gift delivered to your remote workers. Just try to ensure that what you choose is appropriate for the person you’re rewarding and their interests. This will help them to know that you are really thinking of them and not just sending out a run-of-the-mill present. In addition, another reward idea to think about can be to arrange perks for your team, such as free lunches at their office or some bonus time off. Lastly, keep in mind that, for most staff members, being happy in the workplace isn’t just about being appreciated or receiving gifts. For many, it is also very important to develop professionally and have opportunities for advancement as time goes on. As such, a good way to recognize your remote workers is to find ways to promote them, provide them with training, set up mentoring programs, arrange for visits from inspirational speakers, give them the chance to attend important industry and networking events, and hand them additional responsibilities which they can add to their CVs. To ensure you’re aware of exactly what each of your remote workers hopes to achieve over the coming years, it pays to conduct employee reviews annually, at a minimum, or every quarter where possible. This can be done via email and or through online video chats, and will keep you up-to-date on each person’s career goals. Take the time to discuss in these meetings how you can help your employees to achieve the results they’re after.